It's fun to combine functional items along with artistic items. 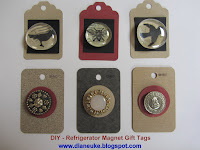 Here are some easy refrigerator magnets that have been attached to gift tags. The recipient will have a charming tag, along with a small gift on the tag itself! Supplies: Large flat marbles, card stock, laminate chip samples, scissors, tag punch, hole punch, rubber stamps and ink, glue, flat round magnets, double-sided adhesive, old earrings, buttons, pendants, coins . 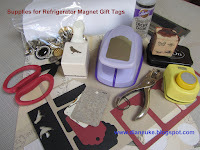 . .
To make flat marble magnets, cut out or punch papers to the size of your large, flat marble. These may be decorated in any way you desire--papers may be rubber stamped, card stock may be punched with decorative punches, etc. 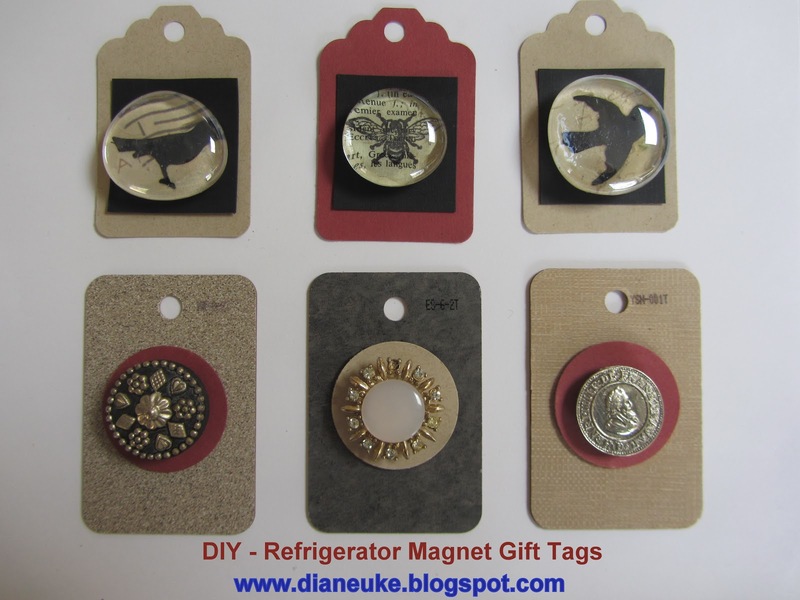 (You may also use old buttons, earrings or pendants.) When you have your completed design, glue to the back of the clear marble, face up. Glue the magnet to the back of the marble. To make the tags, punch card stock with a large tag punch (available at Michael's) and punch a hole at the top of the tag to insert ribbon or cording if attaching to a gift. A laminate sample may also be used as the gift tag! Cut out a small square of card stock and glue to the tag. Adhere your magnet to the tag with double-sided adhesive tape. Voila! A gift tag and gift all in one.